12 Head rotary chuck capper rated from 160 to 450 containers per minute – speeds depending on materials and application. Containers size range: up to 4-1/2" in Diameter; up to 6" Oval; up to 14-1/2" in Height. Cap size range: 13mm to 89mm in Diameter. Equipped with 3-1/4" wide by 144" long conveyor, screw to star wheel in feed, container body clamps, integrated rotary disc cap feeder, cap shoot, cap button transfer arm, air chuck heads set on 6-1/2" centers, turret guarding, no bottle / no cap and star wheel discharge. Mounted on B style frame with enamel coating. Change parts required to accommodate size range of container and cap. Fully automatic, 16 head, rotary chuck style capper, capable of speeds from 200 to 500 cpm – speeds depending on materials and application. Unit is set on 5 1/2" centers, and can handle a maximum cap size of 100 mm, and containers up to 4" diameter. Worm screw to star wheel in feed / discharge, no-container / no-cap, full interlocking lexan guarding, start, stop, reset, and jog controls with e-stop. 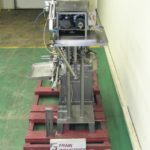 Pneumatic Scale, Model TC450-8, automatic, 8 head rotary chuck capper rated from 24 to 240 containers per minute – depending on materials, application and machine configuration. Cap size: up to 100mm. Container Size: up to 6.25" in Diameter and 4.81x 4.81 square with proper change parts. Equipped with 98" long x 3-1/2" wide container conveyor with 30" long worm screw to star wheel container in feed and cleated cap feeder with 36" x 32" x 20" cap hopper, 100" long x 8" wide belt has 2" high cleats set on 6" centers, cap feed chute,cap pick off, no container / no cap, (8) 100mm friction chucks caps set on 7-1/2" centers to star wheel discharge and 44" long x 3-1/2" wide discharge belt conveyor. Remote control panel has A/B CPU controller with A/B touch pad controls and panelview with set-up, run switch with e-stop. Mounted on heavy duty base frame with interlock safety door guarding and statis light bar. Automatic, 10-head rotary, chuck-style, capper capable of speeds from150 to 375 containers per minute – speeds depending on materials and application. Containers: up to 4 1/2" dia x up to 14"H. Caps: up to 70mm. Has 6" pitch, wormscrew, starwheel infeed / discharge, trans-grip arms for cap transfer and bottle gripping, 38mm cap transfer, quick changeover torkopen chucks, and no container / no cap. Mounted on a stainless steel frame with vibration isolation, height adjustable feet. Automatic, 8-head, rotary capper with a 5-1/2" pitch, capable of speeds from 90 to 240 containers per minute – speeds depending on materials and application. Caps size range: up to 89mm (requires proper change parts). Equipped with a 108" long by 3" wide conveyor, star wheel in feed, bottle gripper finger, trans-grip cap transfer, 15" diameter transfer wheel to container and star wheel discharge. Mounted on height adjustable legs. 6 Heads – change parts available for 80mm & 110 mm. Equipped with 10′ L conveyor with worm screw to star to star discharge and cap sorter. OAD. 120"L x 63"W x 90"H.